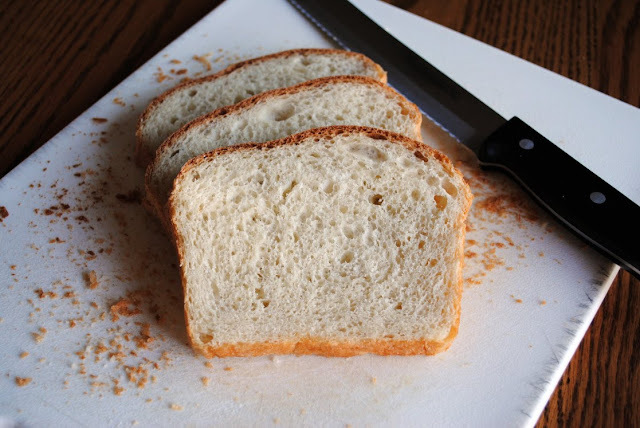 I know that wheat is better for you, but this bread is so delicious, and I always use organic flour, so I know it's better than what I can buy at the store. This is also great with a meal. In a very large bowl, measure out 1 1/2 cups very warm water. Add kosher salt and oil. Stir to dissolve salt. In a measuring cup, measure out 1/2 cup very warm water. Add sugar and yeast. Give it a little stir and leave sit while you measure out the flour into a small bowl. Add yeast mixture to the rest of the water in your large bowl. Add about 3 cups of flour, and stir gently. Continue adding flour, up to 5 cups at first. You'll eventually need to mix this with your hands. Some days I use a sixth cup of flour (if it's very humid), some days the bread is fine with five cups. Knead until all flour is incorporated, and you have a smooth, elastic dough; about 8 minutes. Place about a teaspoon of oil (your choice) onto a clean counter. Spread it around. Cut your dough into two even pieces, and lay it on top of the oiled counter. Cover with a clean dish towel. Let rest about 15 minutes. After 15 minutes, uncover the dough, flatten each piece with your hands, making a rectangle of dough. Fold in thirds, and flatten again. Fold in thirds the other direction, and place into well greased bread pans. Cover with the dish towel again, and let rise until peeking over the top of the pans. This rising time can vary depending on the temperature and humidity. Preheat oven to 350. Bake for 30-45 minutes, or until the top is golden brown. Remove from oven and pans, and place on cooling racks. After the bread is completely cool, store it in a plastic bag or an airtight container. It's wonderful fresh from the oven, but slices much better after it has cooled.